Hammer holes in the glass case that housed the Magna Carta, at Salisbury Cathedral after a 45-year-old man has been arrested on suspicion of its attempted theft, in Salisbury, England, Friday Oct. 26, 2018. British police said Friday that cathedral alarms sounded Thursday when a person tried to smash the glass display box surrounding the Magna Carta in Salisbury Cathedral, and a man has been arrested. A man suspected of trying to steal a Magna Carta from its display case at Salisbury Cathedral has been arrested after he was wrestled to the ground by cathedral employees, British authorities said Friday. 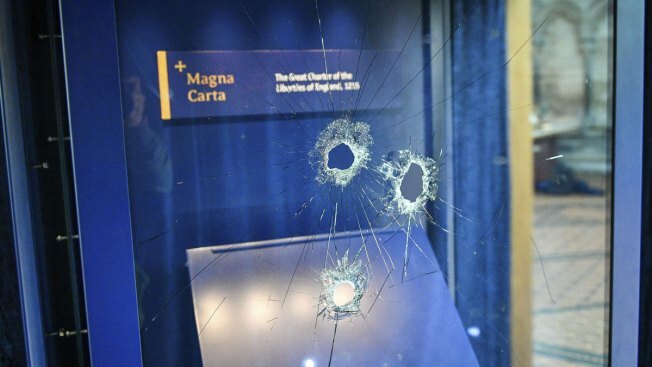 Wiltshire Police said cathedral alarms sounded Thursday afternoon in the southwestern English city when a person armed with a hammer tried to smash the glass box surrounding the Magna Carta. The Magna Carta — Latin for Great Charter — is considered the founding document of English law and civil liberties, a document that influenced the shapers of the U.S. Constitution. The document, granted by King John in 1215, established the principle that the king was subject to the law, rather than above it. It also stipulated that "no free man shall be seized or imprisoned ... except by the lawful judgment of his equals or by the law of the land." The Magna Carta on display at the cathedral is one of four surviving originals. The dean of the cathedral said the suspect was able to smash through one of two protective glass screens housing the precious document. The Rev. 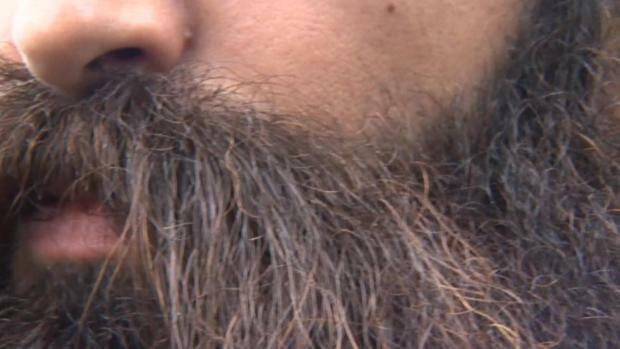 Canon Nicholas Papadopulos praised "courageous" staff members who he said were able to restrain the man for 12 minutes before authorities got to the scene. "He walked out of the Chapter House and tried to leave the cathedral via our work yard and he was detained there and restrained until the police arrived," the dean said. The 45-year-old suspect was arrested on suspicion of attempted theft, possession of a weapon and criminal damage, police said. He has not been identified or charged. Police said the Magna Carta was not damaged and no one was hurt during the incident. But, with its display case damaged, the cathedral said the Magna Carta will be taken out of public view for the moment. "We are very sorry that, for the time being, our copy of Magna Carta will not be available to visitors and will have it back on display as soon as we can," the cathedral said. The other originals are at Lincoln Cathedral and the British Library in London, which has two in its collection. Salisbury Cathedral has also been in the news recently because two Russians accused of carrying out the March nerve agent attack on ex-spy Sergei Skripal and his daughter Yulia claimed during a TV interview in September that they had traveled to Salisbury to see its "famous cathedral," not to poison anyone.